When a young dolphin named Taijah died on Feb.6, officials at the Minnesota Zoo knew they had a problem on their hands. Dolphins are one of the most popular attractions at the zoo, and Taijah was the sixth in the collection to die in as many years. Staff emails show zoo officials were worried about bad publicity in the days and weeks following the death. Those fears were warranted, as news about Taijah's death quickly spread throughout the world. "A dolphin dies in Minnesota, and people in Singapore know about it five minutes later," Zoo Director Lee Ehmke said in an interview. The string of dolphin deaths at the zoo has become a flashpoint for a broader debate about keeping dolphins in captivity. Zoo officials were worried about the fatalities and the public heat surrounding them, according to emails and other documents MPR News obtained through the state Data Practices Act. Zoo officials, however, say the deaths had nothing to do with their decision to close the exhibit this fall, which they said largely has to do with the scarcity of dolphins. When officials decided a few months later to close the dolphin exhibit, Ehmke received thousands of phone calls and emails. He said they were split between dolphin-rights groups applauding the decision, and zoo visitors outraged to see the animals go. The response shows just how divided people are about keeping these smart, fascinating creatures in concrete tanks. Industry experts say the zoo's decision to find new homes for the dolphins doesn't portend any kind of national trend. 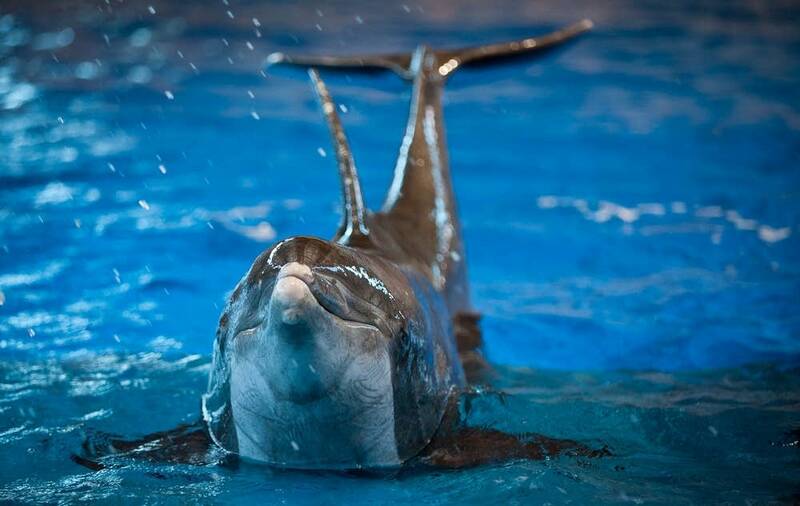 Forty-four zoos and aquariums in the United States display dolphins, and that number has held steady over the years. Document: Read the zoo documents, annotated by MPR reporters. The documents obtained by MPR News suggest zoo officials were paying attention to that larger debate. Taijah's death quickly prompted a high-level discussion about whether to keep dolphins on display. Kevin Willis, the zoo's director of biological programs, raised key questions in an email to Ehmke. "Is the question whether we can responsibly keep dolphins, or is the question whether anyone can responsibly keep dolphins?" Willis asked. "Maybe the question is: Given that dolphins are going to die, can we stand the political and public heat in terms of maintaining a good reputation (and of course our attendance and donors?)" When asked about the email, Willis said he did not mean to express doubt about whether dolphins belong in captivity. He said he was simply trying to determine where the conversation about the exhibit's future was headed. "I just asked, 'What is the framework of this discussion? Is it philosophical? Is it money?' " he recalled. Willis said he believes zoos can and do responsibly care for dolphins. He's not convinced that dolphins in human care are under more stress than those in the wild. "They're not worried about predators, they're not worried about food," Willis said of dolphins in captivity. "They generally know everybody. There are no dolphins coming in, trying to disrupt the social order. I don't know which would have more or less stress." The U.S. Department of Agriculture, which regulates zoos, found that Minnesota's dolphin tanks were in compliance with federal rules. Willis points out that the six dolphins in the zoo's care died of unrelated reasons. "If there was some way we could tie the deaths together, it would be very helpful," he said. The first death came in 2006, when a seven-month-old calf named Harley popped out of the water and cracked his skull. At the time, zoo officials said he smacked his head on the concrete deck when he landed. But it's also possible he hit his head while trying to swim between two pools, Willis said. Harley's mother, Rio, died two months later of an undetermined cause. Fourteen-year-old Ayla was euthanized after suffering complications from scoliosis. In 2009, a calf was stillborn. Last year, 44-year-old April died of respiratory and cardiac arrest. Taijah died in February after experiencing an ulcer that could have been related to stress. The exact cause of the death is unknown, said University of Minnesota veterinarian Arno Wunschmann, who performed the necropsy. Taijah's medical records from the zoo showed that a fire alarm set off four days before her death caused her to act nervously. Dolphins have excellent hearing and can be sensitive to vibrations. But Willis said trainers didn't think much of Taijah's anxiety. He said it wasn't out of the ordinary. "She's had the same reaction when we've wanted to install a graphic and started drilling somewhere," he said. "That vibration is enough to get her nervous, and swimming back and forth. Some dolphins react strongly." Willis doesn't believe the fire alarm contributed to Taijah's deterioration. Her death was a hard blow for the zoo, which had spent years trying to breed new dolphins in hopes of making the collection sustainable. After she died, the zoo's dolphin group dwindled to two. Zoo officials preferred to have at least three or four to create a healthy social group. Acquiring new dolphins is no easy task. Zoos can apply for permits to catch wild dolphins from U.S. waters, but public pressure against such captures makes that practice highly unlikely. Zoos and aquariums rely on other breeding facilities for dolphins, but reproduction is not keeping up with demand. Officials at the Minnesota Zoo say it's that dolphin shortage that forced their decision to close the exhibit — not concerns about the safety of dolphins in their care. Zoo officials were coached to tell the media that animal-rights advocates had no bearing on the decision to get rid of the dolphins, according to plans zoo communications officials distributed to staff to read, provided by the zoo in response to the MPR News data request. But it's also clear from zoo documents that zoo officials considered the controversy over captive dolphins. A zoo task force that met to determine the future of the exhibit was briefed on the growing influence of groups opposed to keeping dolphins and whales in tanks. On the other hand, many Americans have an unabated love affair with the ocean creatures, and there is popular support for opportunities to experience dolphins in captive situations. A poll released last year by the Alliance of Marine Mammal Parks and Aquariums found 97 percent of people ages 18 to 24 would like to swim with a dolphin. Despite the controversy, crowds at the Minnesota Zoo adore the dolphins. At a noontime training session, hundreds sitting on concrete steps cheer the two remaining animals, Allie and Semo. Semo is believed to be approaching 50, making him the oldest male dolphin in human care. This geriatric star is like the Billy Crystal of show dolphins. He jumps arcs across the pool, and in the next beat, he's dribbling a ball with his nose. Thirteen-year-old Dana Marble of Eagan, Minn., grew up watching Semo. Dolphins have been part of the state zoo since it opened in 1978, and the animals are still a big draw for kids like Dana and her friends. "It's always fun to see them," she said. "They're so happy all of the time. It always brings a smile when we see them." Yet the aging Semo can't do the tricks he used to, and a few years ago the zoo scaled back the high-flying shows to shorter and less demanding presentations. The zoo's decision to close the exhibit was the nail in the coffin for what zoo officials have described as a dysfunctional dolphin group. "THE DOLPHIN SMILE IS AN ILLUSION"
Many of the families cheering in the stands want the dolphins to stay. But activists and scientists who oppose dolphins in captivity hope other zoos and aquariums across the country will follow Minnesota's example. They say these highly social animals don't thrive in captive settings — even if they appear to be enjoying themselves. "It's an illusion," said Lori Marino, a neuroscientist at Emory University in Atlanta. 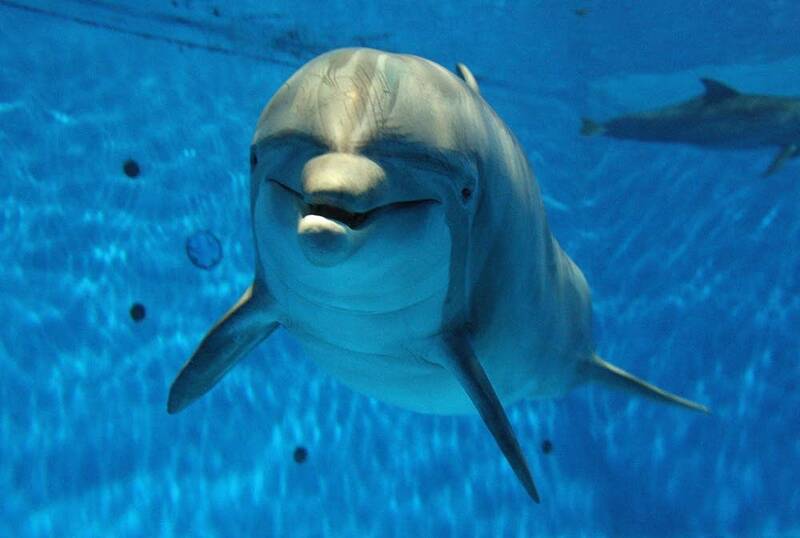 "The dolphin smile is an illusion. "The fact that they are active during the shows, and seem to be happy, doesn't mean that they are." More than a decade ago, Marino co-authored a groundbreaking study showing dolphins could recognize themselves in the reflection of a mirror. At the time, that kind of self-awareness was proven only in humans and chimps. Marino's research on captive dolphins advanced scientific understanding of the animals. But the two dolphins that were Marino's test subjects died of infections shortly after they were transferred to new facilities. That led her to conclude dolphins did not belong in captivity. That would become a personal crusade for Marino. "What we were doing was manipulating these individuals' lives in a way that was causing them a lot of damage," she said. "I started to feel that was not something I wanted to participate in anymore." Marino now considers herself a scientist-advocate, and opposes any research on captive dolphins. She said saltwater pools like the one at the Minnesota Zoo cannot duplicate a dolphin's natural ocean environment, where it can swim tens of kilometers a day. She said dolphins swim not only for food, but as part of their social life. "Even the largest tank in the world is a small fractional percentage of what their natural range would be," Marino said. "There's nothing about the captive situation that is natural." That stress is compounded if a dolphin is trying to flee a bully in the tank, Marino said. Semo, for instance, has been known to show aggression toward his poolmates, especially young males. One email from Willis described Semo's tendency to, in his words, "womp" on other dolphins. Marino and others say that kind of aggression could have caused Harley, the calf, to jump out of the water and fatally crack his skull six years ago. "The problem with captivity is there is no way for these individuals to work out their differences," Marino said. "There's nowhere to go. In the wild, if there was aggression, the way they would work that out would be to disperse. But in a tank, you don't have that option." 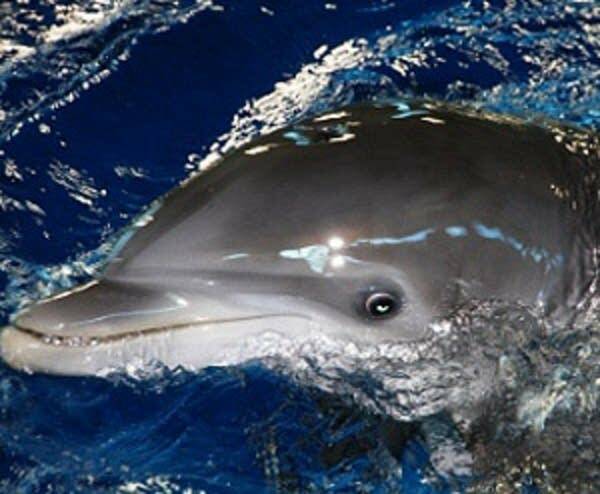 A dolphin at the Brookfield Zoo in Chicago last year suffered a similar fatal injury. In that case, the animal may have collided with another dolphin as they jumped into the air. Proponents of dolphin exhibits say keeping dolphins under close watch is what has brought people closer to the animals. They say it's through these captive settings that our understanding of dolphins, and our love for them, has grown. "I think it's really ironic that the semi-deification, almost, of dolphins among some people probably didn't happen until dolphins were brought into captivity in the '50s and '60s, when they first came into marine parks," Zoo Director Ehmke said. "That's where people really got to experience how incredible these guys really are. Before that, many people assumed they were just fish." The Minnesota Zoo plans to renovate its aquarium exhibit this fall, and then introduce fish and stingrays into the pools where dolphins once swam. Fish might not be exciting as dolphins, but they'll probably be a lot less controversial.